Don’t tell my husband this but I actually don’t mind those Sundays when I’m trapped at home with 47 loads of laundry to do. Those are the days I put something like this on the stove and love on it all day. I usually wait until fall to start with the hearty soups and stews like this one but I just couldn’t resist myself this weekend. And college football started this week. Whoop! Whoop! Surely that alone made it OK for me to make stew. Even if it was 95 degrees outside! This is just a good base recipe. If you like peas, add peas. If you hate carrots, leave them out. Make it your own. Be sure to take a look at the notes on this recipe too. There are several variations you can make if you’d like. Here’s to looking forward to a whole new season of meals you have to eat with a spoon! Heat 3 tablespoons olive oil over medium-high heat in a Dutch oven or large pot. Season meat and ribs liberally with salt, pepper and garlic powder. Add beef pieces and ribs in batches to hot oil and brown on all sides. Remove with a slotted spoon to a bowl; set aside. Do this in batches so not to overcrowd the pan. We’re looking for a nice sear on the meat so we need to give it space. Also, we're not looking to cook the meat through at this point. Add remaining oil to pot then sauté carrots, celery and onion for 4-6 minutes or until onions are translucent. Add garlic and thyme and continue cooking 2-3 minutes. Season with salt and pepper to taste. Add flour to vegetables and stir well. Cook and stir for 2-3 more minutes. Combine water with beefy onion soup, mix well then add to veggies and stir. Once broth is smooth and well combined, add wine and worcestershire sauce. Add meat, ribs and any pan juices back to the pot. Add bay leaf and potatoes then stir well. Reduce heat to low, cover and cook for 3-4 hours, stirring occasionally. Do not let the pot come to a boil – just slowly simmer. Season with additional salt, pepper and garlic powder if desired. When ready to serve, remove rib bones and bay leaf from pot if desired. I love, love, LOVE using short ribs in stew because they are crazy flavorful and also help to naturally thicken it. If you can’t find the ribs or don’t want to use them, just substitute with additional stew meat. You can substitute ox tails, shanks or any other bone-in cuts for the ribs. You can substitute beef broth for the water and beefy onion soup mix. I used a cabernet sauvignon for the wine but any dry red will do (pinot noir, merlot, etc.). Just be sure not to use a sweet red wine. I really don’t think there’s a substitute for the wine but if you absolutely must, substitute with beef broth plus one additional tablespoon worcestershire. The flour helps to thicken the stew. If you can’t use flour, thicken with a cornstarch slurry the last hour of cooking. YES! You can make this in a crock pot. Once everything has been seared and sautéed, throw all the ingredients in and cook on low for 6-8 hours or high for 4-6 hours. I can eat stew or soups even during the hottest summer, Slap some cornbread on the plate with it and HELLO - now you're talking. Yum, Love stew season!! All the notes are super helpful! TY! As a person that does not drink at all, but doesn't mind using in cooking, I would love a basic lesson. What red/white wines etc do you use for what ? Once you open a bottle does that mean you can't keep it for 3-4-6 months until the next time you need it ? Those small bottles are great and what I have been using (who knows if I have purchased correct wine for correct recipe) but they only come in a limited variety. Can you help those of us who don't drink? I use Merlot or Cabernet Sauvignon for red wine and Chardonnay for white wine. I use Sherry for mushrooms and sauces as white wine also. It seems to me a little more buttery and maybe even a touch sweet?? I have found You can't really keep wine for too log in the refrigerator unless it is labeled a cooking wine. It tastes vinegary after a while. I have not had good luck with "cooking wine" either as it must have some additives that taste funny to me although supposedly it lasts longer. I store the Sherry in my cupboard and it seems to do okay.. I also use the small bottles and get them on sale. These are things suggested to me by friends who are better chefs than I.
I'm not a drinker, either, so I use cooking wine. Since we are not drinkers, we won't know if it tastes strange or not. That's the way I look at it. And it does last a long time. I keep mine in the cupboard instead of the fridge. Please add the YUM icon button to your website. Thanks so much for sharing your great recipes! It looks delicious!!! 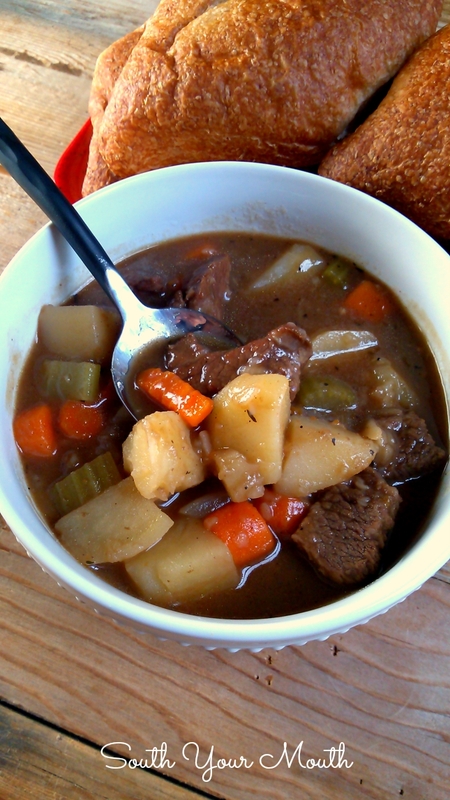 Beef stew is my favorite cold winter meal with crusty fresh baked bread!!! Pinned! I used Burgundy wine in my stew. Also a way to thicken the stew is add instant potato flakes.......a little at a time until you get the thickness you desire. This looks and sounds delicious. Would this recipe feed five men with hearty appetites (for hunting camp)? The best stew recipe. You have to use the short ribs - it makes the best broth. I could just drink it up. Would there be enough liquid in Pot, to make Dumplings? great idea Chris!have only made chicken w/dumplings but definitely gona try the beef stew with them! Sorry, don't have an answer to your question tho.